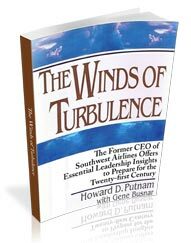 Howard Putnam is the former CEO of the highly successful Southwest Airlines. Howard later was recruited to be the CEO of financially failing Braniff International, order & was the 1st CEO to restructure a major airline into, through & out of bankruptcy. Earlier in his career he spent 20 years with United Airlines, his final position being Group Vice President of Marketing.